Chef Charlie Kleinman (Fish and Farm, Fifth Floor) is taking his roots in fine dining and the locavore movement and branching out in his new project, Wexler's. At his newest restaurant, the flavors of the American South's proudest tradition, barbecue, will meet Charlie's modern French technique. To this end, Charlie set out to Texas to taste some of the country's best barbecue, which will most certainly influence the menu at the upcoming Wexler's. The restaurant is set to open early June in San Francisco's Financial District. Beef, salt, and post oak. No, this is not a central Texas Earth Wind & Fire cover band, but the three main ingredients in Texas BBQ. That's it. Nothing fancy, no secret dry rubs, mysterious mix of hard woods, or some sauce bubbling for hours behind the scenes that only one person has the recipe to that is guarded like a nuclear launch code. The key to Texas BBQ is to take your meat, season it with salt (and for some, cracked black pepper), and let it smoke slow and low for hours on post oak until it reaches its culinary destiny. This was a revelation to me when I headed on down to Austin with friend and writer Jordan Mackay to follow the BBQ trail. After two days of hitting five of Texas's best BBQ joints, I had plenty of BBQ knowledge to help perfect my new restaurant, Wexler's. Jordan had scouted out this trip just months ago, packing it with stops considered by many to be the best Texas had to offer--including one that is revered as the best BBQ joint in the country. We set off early one Friday morning (okay not that early, but we can blame the car rental place for that) to Luling, Texas, some 45 miles from our home base of Austin. 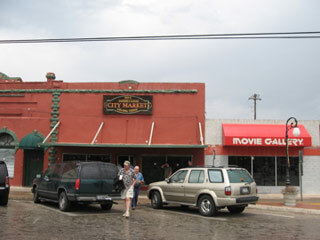 Our destination was Luling City Market (633 Davis St., Luling, Texas, 830-875-9019), a red shack in the middle of central Texas. 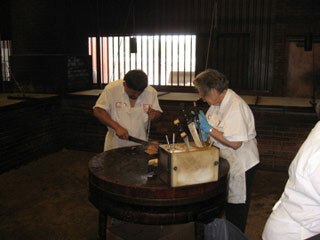 Inside, the smells of smoke and meat were almost too much for us to handle. 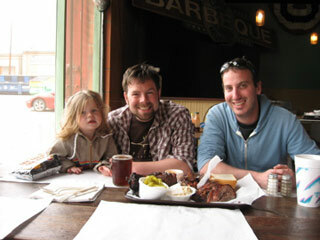 The three of us (we were joined by Jordan's brother in-law, Seattle chef John Neumark) entered with mouths watering and laid down the ground rules: we would order brisket, beef sausage, and pork ribs--not classic in this area, but they have become a staple. The setup is the same everywhere: you order by the pound, your order is sliced, weighed, and put on brown paper which doubles as plates. 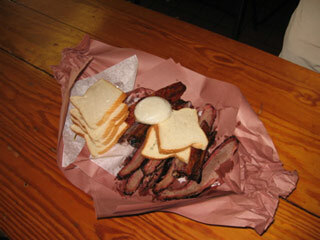 The barbecue comes with sliced white bread, sliced white onions, and pickles, also usually sliced. After two days of eating like this, I think I'd like to debate with Emeril whether or not this is in fact the holy trinity. In order to be consistent, I tried everything in the same order always: first, brisket without sauce; next, ribs; and then the sausage. Once everything was tasted the way the pit master intended, I would make myself a true BBQ sandwich. One piece of white bread wrapped around some brisket with pickles, onions, and some BBQ sauce. Anyone who tells you that the key to a good sandwich is "good bread" has never had one of these--the light, Wonder quality of the bread lent the perfect balance of texture and flavors to the sandwich. "Good" bread would have been too much. The food at City Market was just as expected: heavily smoky with that beautiful pink ring around the meat that, like the rings on a tree, denotes the time spent smoking under the tender care of a pit master. The brisket was moist, although the slices closer to the end did get progressively drier and smokier, with the slightest hint of seasoning. The ribs were tender, but still provided a nice mouthfeel when bit into. The ribs were finished with just the smallest bit of a sweet glaze that acts as a counterpoint to the richness of the meat. The sausage was heady, redolent of black pepper and surprisingly moist for a beef sausage. All in all, an excellent way to start the tour, and the bar was set high. After eating too much at our first stop, it was time to go to Lockhart, Texas, the self-proclaimed barbecue capital of Texas. 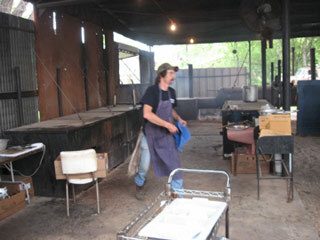 The main street here is littered with BBQ joints, but only two had been vetted and found worthy of our visit. These two spots were the product of one of the most classic culinary feuds: when two members of a family bound in tradition don't see eye to eye, so they split off and each open their own place. 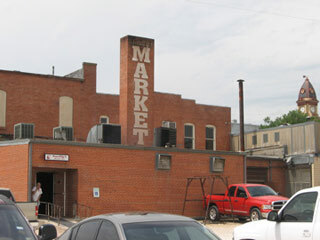 In this case, the family spat spawned Smitty's Market (208 S. Commerce St., Lockhart, Texas, 512-398-9344) and Kreuz Market (619 N. Colorado St., Lockhart, Texas, 512-398-2361). First we arrived at Smitty's. We were greeted immediately at the door by an open fire of post oak. We were lucky that the weather was extremely temperate, but one can only imagine what it must be like to wait on line here in 100-degree temperatures while standing next to an open fire. This place had all the ambiance one could ever want, with tables right next to the BBQ pit and Fox News discussing how Somali pirates were agents of Obama. One could actually feel the terroir. 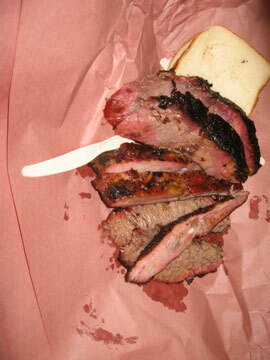 The BBQ here was quite good, but a little dry and seasoned with a distracting amount of cracked black pepper. The sausage was so fatty that one bite each set us back for the rest of the day--our mouths seemed to be coated with fat from then on. Hoping to find more room in our stomachs somewhere in the half-mile to Kruez's, we came upon its modern barn-like structure, replete with warning signs for salesmen and vegetarians to stay away. It is here that I found my favorite brisket of the day. It was so well marbled and juicy that in my current state I could only muster a few bites, but it was salty and sweet, if a little lacking in smoke. After a restful night of drinking until 3am on Jordan's chef friend's porch near the University of Texas campus, we got up at the crack of dawn to head to Lexington, Texas, and to what was to prove to be the star of the show. Snow's BBQ (516 Main St., Lexington, Texas, 979-773-4640) has only been open for the better part of the decade, but to me it's the Vatican in the Church of BBQ. We could tell this place was a cut above just by watching our brisket get sliced--it glistened with fat and seemed impossibly juicy. We didn't make it early enough to this spot to try the chicken (Snow's is only open Saturdays until they run out of meat), but we got plenty of brisket, ribs, and sausage. When trying the best of the best of anything, one expects all entrants to be tightly bunched at the top. Not so here. Snow's was far and away the best of what we tasted. I tried to ascertain what it was that made this stuff different, but was told that even if I arrived at 3am to watch them start the fires and proceeded to watch every other step they took, I would never be able to duplicate what came out of those smoky pits. The woman who is the pit master here has built up some seriously good BBQ karma--each pass of the electric knife slices brisket so tender that it falls apart in your hands. After our visit to the BBQ Mecca, we had just one more stop. 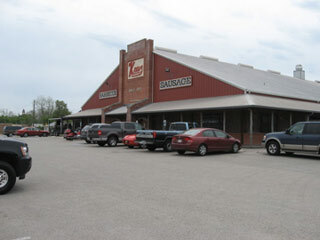 Louie Mueller (206 W. 2nd St., Taylor, Texas, 512-352-6026) was at a sizable disadvantage with its placement right after Snow's, and this was not helped by walking in the door and seeing a poster with Guy Fieri's smiling face and big thumbs up. Surely there was nothing here for us if the Food Network had already staked its claim. Well, let's just say I wish San Francisco had a place this good--although compared to the rest of our destinations, we all agreed this place came in fifth. The meat was covered in large-grind cracked black pepper, making the brisket taste more like pastrami than that sweet and smoky beef taste we had gotten used to. 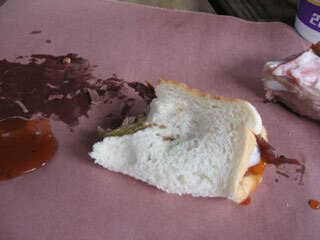 That said, this might have been my favorite BBQ sandwich of the trip for just that reason. It is with a much more knowledgeable palate, and a good extra ten to fifteen pounds that I come back to San Francisco. Seeing the alchemy that occurs with nothing but smoke, salt, and meat underscores the simplicity and technical knowhow that go into this cuisine, leaving a high bar for us to reach.